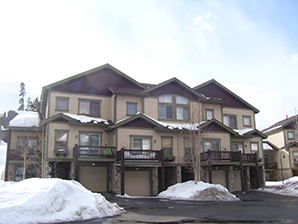 An attractive complex located near the Raven Golf Club at Three Peaks. A total of 78 townhome units are housed within 15 buildings. The complex was constructed in three phases. Buildings are wood frame with asphalt shingles and wood siding. Common amenities include a playground and dumpster enclosures for trash and recycle service. Please remember, you must receive written approval from the Association Board of Directors prior to proceeding with any unit modifications or any modifications to the common elements (to include planting flower beds). All work days will be 4 hour work days, with work shifts running from 8 am to 12 noon or 9 am to 1 pm. Each unit must work a total of 8 hours (two people can work one 4 hour shift or 1 person can work 2 work days) or the unit will be billed $150. The next Board of Directors meeting will be held May 6, 2019 at 5:00 pm in the office of Summit Resort Group. The 2019 Annual Meeting will be held on Saturday, November 16, 2019 at 2:00 pm in the Silverthorne Town Hall.